When opening your convertible top you should not have to push the rear window section down by hand. 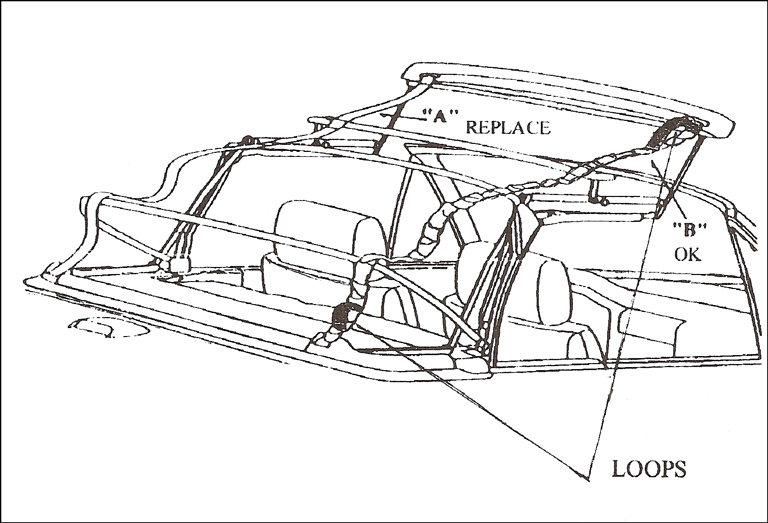 Although you cannot see them without removing the top or headliner, there is a pair of nylon tension straps that pull tighten together when open the top, which allows the rear window bow to retract enough so the window and rear of the convertible top clear the top lid without you have to do anything by hand. 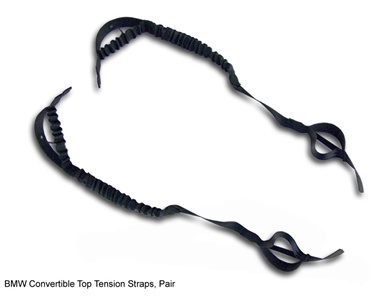 These tension straps will lose their elasticity over time or the front or rear loops may break. Failure may cause damage to your convertible top and void your warranty. So, we recommend replacement when you change your BMW convertible top. Although it may be possible to reuse your existing tension straps, we highly recommend you purchase new straps when replacing a convertible top for the BMW 3 Series. Used tension straps are subject to stretching over time and will wear out faster than your new convertible top. Replacement straps are relatively inexpensive and can only be accessed by removing the headliner and top so it is a good idea to get new ones. Failure may cause damage to your convertible top and void your warranty.